The building was formerly the silver factory for Tiffany & Co. jewellers. Given the significant history, it was important that the original details were maintained and restored while updating the newer elements and functionality. The dropped ceiling was removed, the double-hung wooden windows were restored and the brick walls were exposed. New wide board floors were treated using a traditional Scandinavian process. 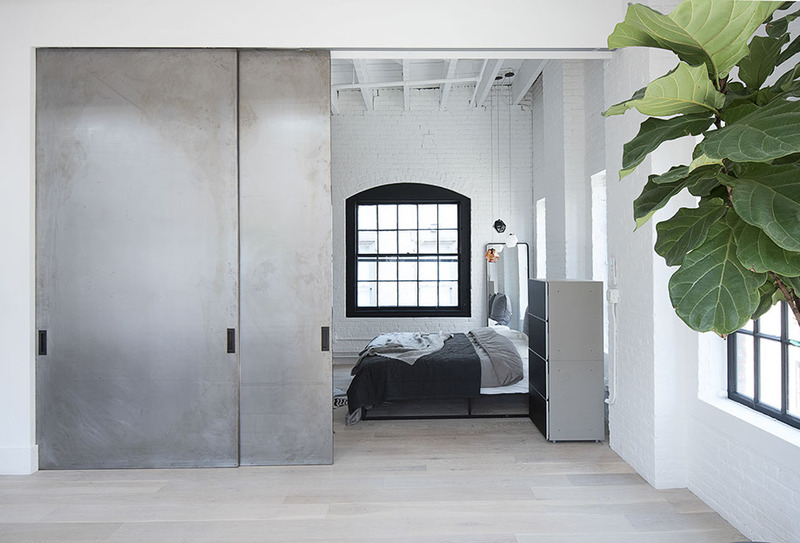 The industrial aesthetic, including the black steel windows and large custom steel panels for the bedroom wall, were also a nod to the history of the loft. The clean modern lines against the uneven historic lines of the walls and beams against the new clean white floor and white walls provide a sense of serenity. The contrast with the unfinished white walls and the raw concrete tiles, the bronze tomb and concrete kitchen adds texture and richness. The full-height book-matched marble wall in the kitchen compliments the rich bronze of the kitchen and also elevates the space adding a hint of luxury within the industrial space. The loft is perched at the back of the building and is surrounded by yards and trees. They maximised the openings for the existing windows and added four new window openings in the rear wall and also two skylights in the roof allowing the natural light to flow into the apartment. The bathroom is all about respecting the history and character of the loft while elevating the space with finer elements. The tiles are large format porcelain tiles designed to resemble concrete. This was a nod to the industrial character of the loft. The stark white tub which is made from a resin quartz composite stands in contrast to the concrete tiles, with its clean lines. The vintage holophane bathroom lights contrast the more modern elements of the room and add a soft glow keeping the space from becoming overly functional. The apartment contains two separate large bedrooms with en-suite bathrooms. The floor plan consists of a large open living room with a dining area at one end and an open living space at the other. Huge steel panels running on a track are used as the master bedroom walls. The idea is to maintain the open floor plan of the original loft as much as possible. The same steel was used to create an extra large front door that pivots to the reveal this large floodlight open space. Extra tall and wide interior black wooden doors accentuate the ceiling height. The furniture is minimal and contemporary to keep the openness of the loft intact and allow the structure and space to dominate.